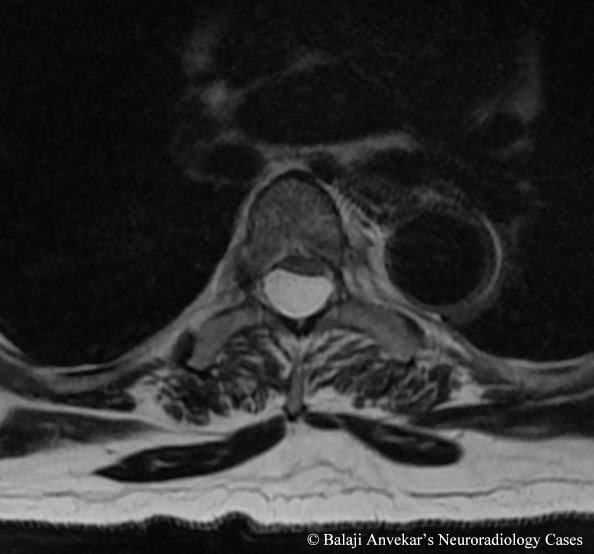 A 30 y male presented with intermittent backache, mild progressive paraplegia. 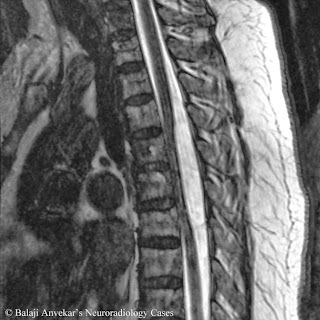 Anterior spinal cord dysfunction on neurological examination. No obvious dorsal column involvement. MRI spine shows anterior thoracic cord displacement with flattening. Wide sub arachnoid space dorsal to cord iso intense to Csf. 2. Idiopathic Anterior Spinal Cord Herniation / Adhesion. In a study of middle aged patients of both sexes presenting with chronic progressive anterior cord dysfunction with imaging demonstration of anterior thoracic cord displacement is either by a posterior arachnoid cyst or anterior dural adhesion / herniation. Cord thinning was frequently found without signal abnormality in cord. A dorsal arachnoid cyst is one of the most important entities included in the differential diagnosis of idiopathic spinal cord herniation. If findings on standard MR images are equivocal, phase-contrast MR imaging or CT myelography may be helpful for detecting the free flow of CSF and excluding an arachnoid cyst. If it’s an obvious posterior Arachnoid cyst, needs decompression for sure. 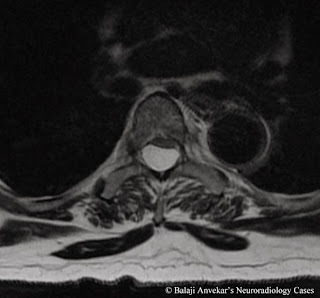 Cases without appreciable Arachnoid cyst can be associated with either anterior spinal cord herniation or adhesion. Mechanisms leading to anterior spinal cord herniation described in literatures are congenital anterior dural defects, duplication and rarely trauma. A dural defect cannot be demonstrated on MRI, although absent visualization did not exclude a defect at surgery. In patients in whom no defect is found at surgery; instead, the cord can be anteriorly tethered by arachnoid or dentate adhesions. The thoracic anterior spinal cord adhesion syndrome (TASCAS) is a novel term to describe patients presenting in this way. The frequency with which adjacent disc abnormality is seen in surgical case report supports the role of disc disease in the aetiology of TASCAS. One possible mechanism would involve inflammatory change, incited by a diseased disc, causing adhesions with the adjacent dura. The anterior cord surface becomes tethered by associated arachnoid and/or dentate ligament adhesions. Subsequent disc resorption could result in formation of a dural retraction pocket predisposing to progressive pathological cord displacement and subsequent herniation. Other factors may also be contributory, such as the relatively anterior position of the cord in the mid-thoracic spine due to the normal physiological thoracic kyphotic status, bringing the spinal cord into close apposition with the discovertebral complexes. MRI is considered sufficient for the diagnosis of Posterior Arachnoid cyst Vs Anterior Cord herniation / Adhesion in most cases. Use of three-dimensional volume T2* sequences (such as CISS /FIESTA) as in this case provide high-resolution images which aid the decision making while limiting the need for invasive procedures. Even with these high-resolution series, the exact nature of the abnormality can only really be defined at surgery. In any case, the decision whether to operate or not is ultimately made on clinical rather than radiological grounds. If a surgical approach is to be contemplated, the anterior aspect of the cord should be visualized intra operatively, regardless of the degree of radiological certainty in the pre-operative differentiation between hernia or adhesion.